"I'll celebrate myself.. No matter what..!" While grieving on my unrealized dreams, I’ll keep on cherishing my lived ones. I’ll go with the ‘Remnants of Somethings’ rather than chasing the concept of ‘All or Nothing’. Yes, I’ll always love my medusa hair look yet I’ll glitz myself in the mirror pouting my lips with red lipstick. I’ll let no one to judge and decide on my Substance ignoring my Self-worth or prejudicing my Pride. I’ll smile on my feats and laugh on my spoofs; cry on my damp-squibs and lament on my defeats; wail in my frustrations and smirk on my pranks. My vulnerability is my brawn. It makes me human. I won’t let anyone doubt and question it as my infirmity. I know people will scrutinize my perfections, yet I’ll love to live with my faults and flaws. 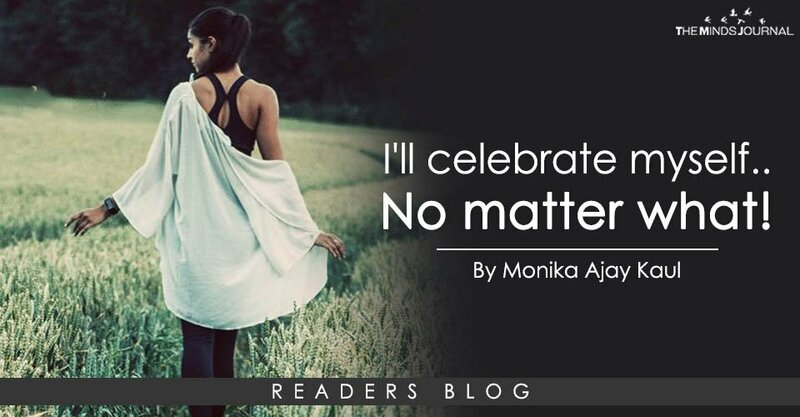 Oh yes, I’ll still celebrate myself… No matter what. Be yourself. Let your vulnerabilities be your might. Don't ever consider them as inabilities. They define you and make you YOU. The Human.